I am just about finished building my ark.....OY!!!! We have just been pummeled with rain the last two days. Today was absolutely horrendous though!!! Thank goodness it's not cold enough for snow otherwise we would probably be buried!!! It may be rainy out there, but on here it's SUNSHINE TUESDAY!!!!! 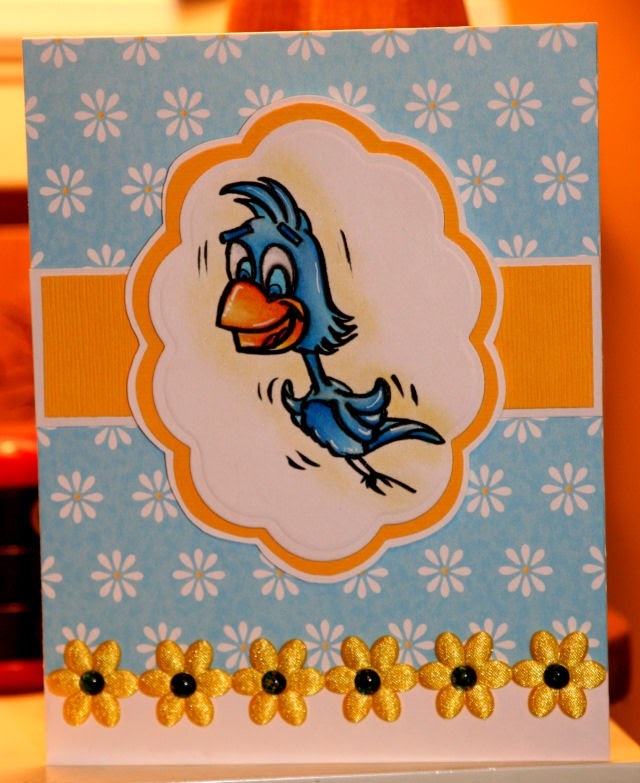 Take a look at this 'tweet' little bird :) He can be found, along with a few other adorable feathered friends, over at Sunshine's Stamps Now if that isn't enough to get you over there....how about a free image? That's right...head on over there to see what image she is giving away for FREE!!! As for this little blue dude, I used my typical technique on him......base colored with Copics, then highlighted and shaded with my Prisma pencils. At least he is Springy looking....even if the weather outside isn't. At least he isn't soggy from all the rain. Very cute. Love your cards. Coo Coo is cute-cute!!! Love it!!! Sunshine is right - coloring is spot on, girlfriend! So cute and the colors definitely make me think Spring! This is sooo cute! Love the color. Hugs! This turned out great- I love how coo is framed by scallops. You colored him so nicely and I love the flower border too.